It was truly a fantastic day on Oct. 17 as 28 foursomes played golf in this year’s Greenebaum Comprehensive Cancer Center Golf Tournament, a benefit for the University of Maryland Marlene and Stewart Greenebaum Comprehensive Cancer Center (UMGCCC). That evening, more than 150 golfers and guests enjoyed socializing over a delicious dinner, bidding on live and silent auction items, and listening to talks on the future of cancer care. By the end of the event, more than $471,000 was raised for UMGCCC. 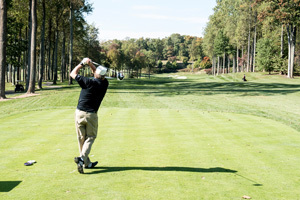 This year’s tournament and dinner took place at Caves Valley Golf Club, a premiere golf course in Owings Mills, Md. that sits nestled among towering trees and rolling hills. The golf tournament kicked off just after lunch and finished with three teams tied for first place with a score of 53. A tiebreaker settled the score, awarding first place to John Wildrick, Chris Miller, Levi Lloyd and Norm Butler from Dixie Construction. Second place was presented to Michael Craig, Drew Bumbach, Michael Sweet and Eric Follman from Travelers; and third place went to Barry Stoler, Michael Meagher, Greg Wilkins and Daryl Smith from Lexus of Towson. During the evening program, guests were warmly welcomed by University of Maryland Medical Center’s (UMMC) newly appointed President and CEO, Dr. Mohan Suntha, and UMGCCC’s Director, Dr. Kevin J. Cullen. Dr. Graeme Woodworth, director of the Brain Tumor Treatment and Research Center at UMMC, also shared highlights of his research on focused ultrasound technology. This revolutionary piece of medical equipment could profoundly impact those living with brain cancer and other serious neurological diseases. Special thanks to all of our sponsors, especially our Champion Sponsor, Chesapeake Contracting Group. We would also like to recognize our Birdie Sponsors, which include: Bopat Electric Company, Inc., Cohn Reznik, Dixie Construction, Greenebaum Enterprises, Klein Enterprises, Live Green Landscape Associates, LLC, Maryland Proton Treatment Center, and University of Maryland Medical Center Department of Radiation Oncology. And a big thank you to our golfers, attendees, and donors for making this year’s Greenebaum Comprehensive Cancer Center Golf Tournament a major success. Your combined support will immensely impact the lives of countless men, women and children facing a cancer diagnosis.